After the three day weekend, you might expect we would have lots of projects around the garden. Not necessarily the case! We really had only one larger project to complete, since everything is planted and we aren’t ready to start harvesting anything. That big project was spreading mulch. We had some really nice wheat straw to use. It makes the plants look even greener! 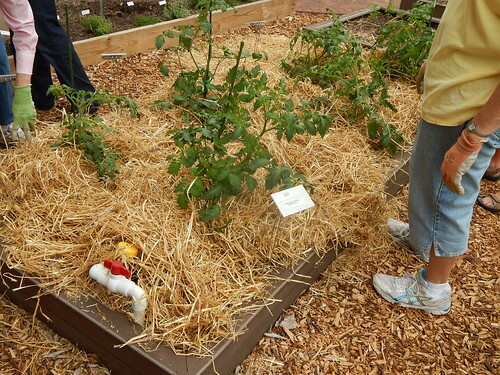 We try to put about 3 inches of straw around most of our plants. We mulched the tomatoes, peppers, and eggplant today. 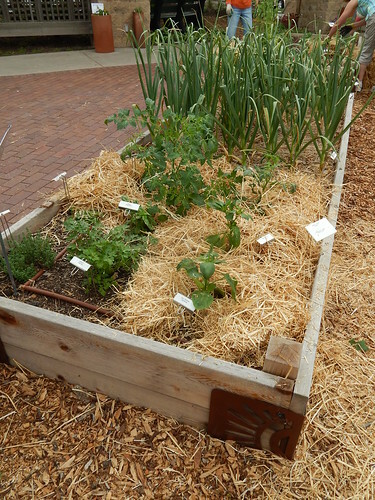 Here’s the mulched Pizza Garden. The garlic and shallots still have a little bit of straw left from last fall, so there was no reason to try to replenish their mulch. Things like beans and herbs we didn’t mulch, although we probably could have. The basil we left unmulched because it is still pretty small and it could use some more heat in the soil. So go out and find yourself some mulch (if you haven’t already)! Posted on May 28, 2013, in Working in the Garden and tagged eggplant, mulch, mulching, peppers, summer, Tomatoes. Bookmark the permalink. Leave a comment.